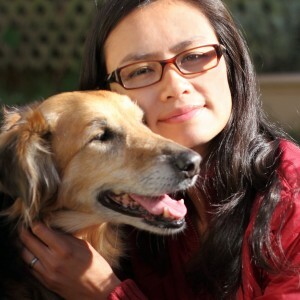 Shelley Leong (formerly Leong-Peterson) is a professional dog trainer and behavior counselor based in San Francisco, California. She is an Honors graduate of the Academy for Dog Trainers, with Jean Donaldson as her main mentor. The Academy is considered the gold standard of dog training schools worldwide. She is a recommended trainer for the SFSPCA’s Training and Behavior Department. Shelley is also certified in Pet First Aid, and is a certified professional dog walker trained in pack management and safety through dog*tec’s Dog Walking Academy. Committed to continually improving her skills and sparking her own flashes of insight, Shelley regularly attends conferences and workshops such as the clicker training conference organized by Karen Pryor. She also teaches as a part-time trainer at SF Puppy Prep, one of the Bay Area’s most highly-regarded dog training and day care centers. She is a full member of the Association of Pet Dog Trainers and the Pet Professional Guild. Shelley gives back to her community through her work as a volunteer dog trainer for the San Francisco SPCA’s Behavior and Training Department where she specializes in working with shy and fearful dogs. She is also a coach for the SF/SPCA’s Volunteer Internship Program and Kim Moeller’s Reactive Rover program, which works with dogs who are aggressive on-leash. Shelley is passionate about helping dogs, and has seen firsthand how many dogs are surrendered to the shelter because of behavioral issues that could be easily resolved with proper training. She hopes to prevent such tragic separations by training dogs so they can have happy lives with loving families. Proven effective, completely humane, and actually enjoyable: positive reinforcement training is the modern way to solve dog behavior problems.